With India having a low level of formal skill attainments, it is important to make skill training aspirational. Confederation of Indian Industry (CII) has been engaged since long in helping workers take pride in their skills. One way of doing this is through skill competitions, and CII has organized these competitions in select trades for almost three decades at the state and national level. Its efforts moved to the next orbit when CII joined the World Skills International Organization and took skilled Indian masters to compete on the international stage at the ‘Olympics of Skills’. For promoting vocational training in industrial skills and recognizing individual merit and excellence in skills, CII initiated the WorkSkills Competition on the lines of the Skill Olympics organized by the industry in Europe in 1989. The first ever CII WorkSkill Competition was organized in 1989 at the Advanced Training Institute, Dasnagar, Howrah. With overwhelming response, CII institutionalized the WorkSkills Competitions as a major event. CII WorkSkill Competitions are now held every year. These competitions are organised in two stages, one at the regional level and one at the national level with two main categories for the participants – above 22 years and below 22 years. Entering its 30th year, the WorkSkills Competition saw heartening response last year with approximately 700 competitors from 55 companies and training institutes participating in more than 35 trades at the regional and national level. The WorldSkills competition is the biggest vocational skills competition in the world and aims to foster skill excellence and raise the recognition of skilled professionals worldwide. The competition brings together youth, industries and educators to give youth the chance to compete, experience and learn how to excel at their desired skills. WorldSkills is the flagship event of the Amsterdam based not-for-profit organization WorldSkills International and is held every two years. In 2007, India joined the WorldSkills International Organization as its 48th member. WordSkills India, an initiative of the National Skill Development Corporation (NSDC) under the Ministry of Skill Development Entrepreneurship, Government of India has been leading the country’s participation in the WorldSkills International Corporations since 2011. CII has played a pioneering role in the WorldSkills International Competitions. CII believes that the WorldSkills Competitions positively impact the economic and social well-being of people from all sections of society through improving traditional trade and craft skills along with latest technology. CII has been supporting the NSDC initiative and conducts competitions in the Manufacturing and Engineering and Social Service Skills for the WorldSkill International Competitions since 2007. CII embarked on its journey in the WorldSkills Competitions with the aim of placing India on the global skill map while also encouraging competitiveness within the industry. CII’s journey in the WorldSkills Competitions commenced in 2007 when it led the Indian contingent in 5 trades. In 2009, an Indian participant won the first silver medal in mouldmaking in Canada, where CII led the Indian contingent in 2 trades. CII hosted its first Indian business delegation and led 7competitors in 5 trades in London in 2011. In 2013, CII supported Indian competitors in 6 trades in Germany and in the 2015 edition, again in Germany, CII supported 7 trades, with India winning 3 medallions of excellence. In 2017, the World Skill International competition was held at Abu Dhabi, where CII supported 9 skills. Indian won 1 silver medal and 3 Medallion of Excellence in the trades supported by CII. Andhra Pradesh State Skill Development Corporation (APSSDC) along with CII hosted its first-ever State Skills Competition 2018-“Naipunya”. CII was the Execution Partner. The Andhra Pradesh state skill competition “Naipunya” took place in four different clusters from which the final participants were selected after screening for the final state level competitions. The winners from the clusters participated in the state level competition between 10-11 May 2018. A total of 165 competitors participated in the competition in 26 trades. After an exciting round, 8 candidates were selected for the national level in 6 different skills. 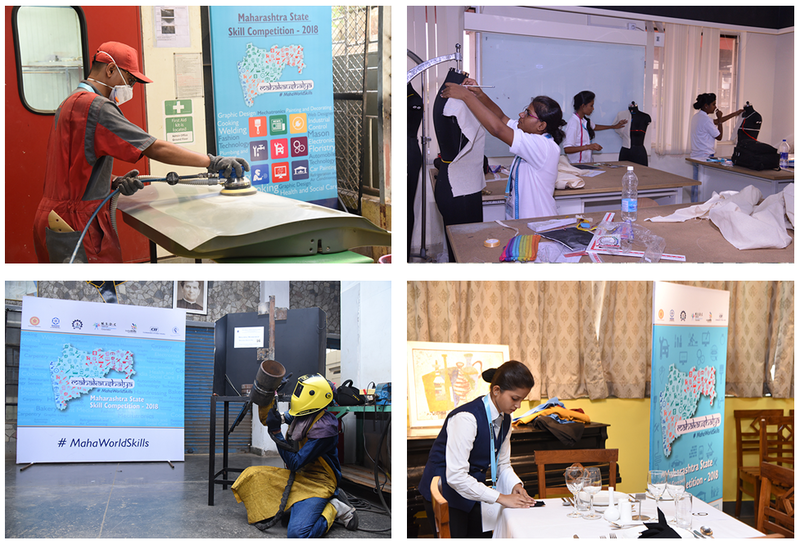 The Maharashtra State Skill Development Corporation (MSSDS) and Directorate of Vocational Education and Training in collaboration with CII also hosted its first state skill competition “MahaKaushalya” in 2018. Competitions were held at two levels – cluster level and state level, with close to 2200 candidates participating in the competitions. Competitors showcased their skills across 32 skill trades. Winners of the state skill competitions were given due recognition by the State and Industry for their exemplary performance while all competitors were issued a participation certificate from the Government of Maharashtra. The winners would stand a chance to compete in the Regional and National rounds of the IndiaSkills Competition in 2018. The winners of IndiaSkills 2018 will then get a chance to compete in the WorldSkills Competition to be held in Kazan, Russia in 2019. The CII skill competitions endeavor to transform the skill landscape of India by promoting skill excellence among talented Indian youth. They provide youth the opportunity to participate in national and international skill competitions, thereby placing India firmly on the global skills map.